Speakers: These are Emotion 2 made by OLS. They are are built at the end of 1997. Tweeter: Morel MDT 30S; Midrange: Seas Excel W11CY002; Woofer: Seas Excel W17E002. Both Excel are fitted with a magnesium membrane, which the photos clearly show. The original design was 86cm in height, but I made the enclosure 1 meter in height. The milling is done by myself, except the sides. The filter is hard-wired and is mounted in the extra space under beneath the speaker which is also sand-filled. The total weight of one enclosure is 36,5 kgs. I put on the veneer myself. Cabling is Van den Hul CS-12 and damping is by 4 pieces Deflex. 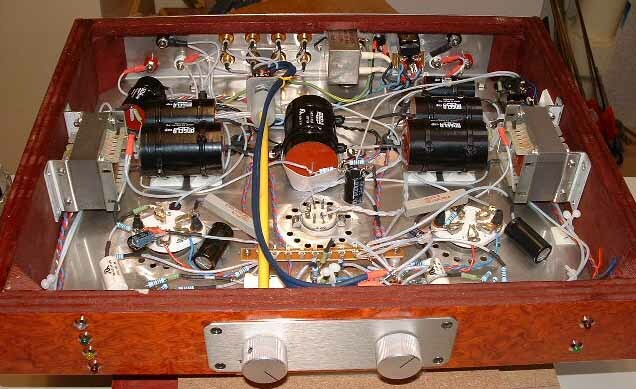 The woofer is mounted using 8 bolts instead of the standard 4. Each unit is sealed using Deflex sealing tape. Cd player This is a modified Teac VRDS-10. Modification is done by "de Jong Systems". Interlink used is Van Den Hul " The First ". Extra data on the 807SE: All the internal wiring, filament and powertransformer excluded, is pure silver teflon tubing insulated. Input and driver tubes are 6SN7 WGTA - Jan Philips ECG. 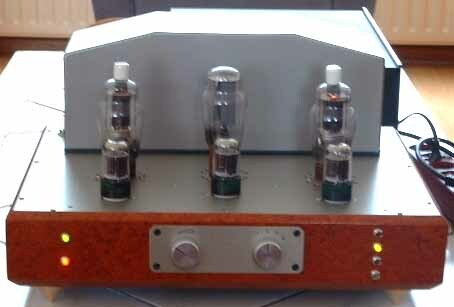 Power tubes are 807 Natinal Union ( VT 100 A ) and 807 RCA spare. Kathode bypass capacitors on both 807's are Black Gate type FK. Coupling caps are Chateauroux tinfoils. The wood for the amplifier is veneered, like my speakers. Loudspeakercable: Home made using silver/teflon. I will try to put in a 6mm air-tube in between the conductors soon. Well: How does it sound?? To be honest, I couldn't tell... Jim (VT52.com) however, insures me that it sounds good - well who am I to argue with that? ?